Sally Gil is collaging and painting her way through Vermont. The Brooklyn-based artist recently completed "Out of This World," an installation at the Bennington Museum. 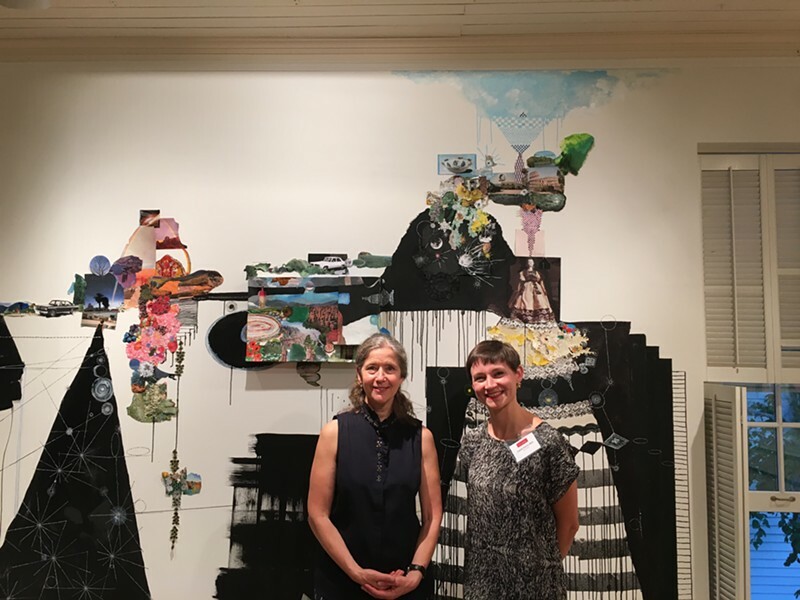 And Friday night, her site-specific installation "Intergalactic Current" opened to the public at the Helen Day Art Center in Stowe. According to the Bennington Museum's website, these are Gil's first exhibitions in Vermont, her native state. Both shows were curated by Sophie Bréchu-West, founder of 571 Projects, which offers curatorial and consulting services to organizations and private clients. The majority of the gallery is still occupied by Pat Steir's exhibit, which is well worth a visit itself. Gil's installation makes use of the West Gallery, a cozy space to the right of the gallery's reception desk. 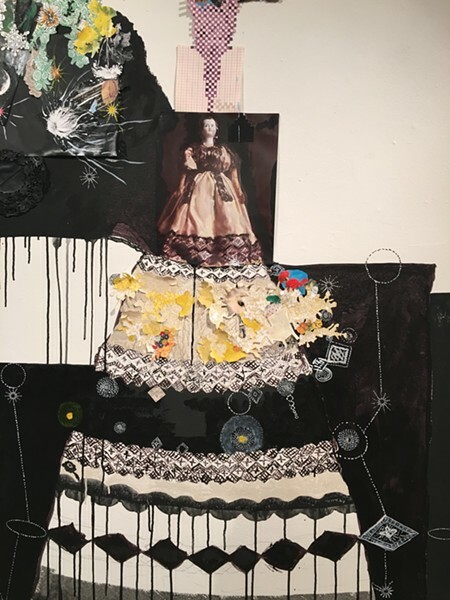 Her work incorporates minute collage elements — images of a doll, patterns from a magazine, snippets of words from a book — in creating vibrant imagined landscapes. Paint acts as a binding agent, bringing together disparate elements and creating a sense of visual adventure. Especially in the work on the left side of the gallery, you can't help but feel the dotted white and black lines are leading you on a magical escapade through time and space. In her artist statement, Gil refers to her found images as icons. "These icons are like words in a poem, linked by painting," she writes. "Even though the images are of real places and from this world, say, a tea-bag wrapper or an image taken from an encyclopedia, what is real in my work and happening in real time is the painting. Painting and drawing serve as a link to the present moment." Gil's work will be on view through November 13. It will serve not only to inspire the imagination of the public but the curious minds of fourth-, fifth- and sixth-graders in an after-school class. They'll be drawing — figuratively speaking — on her installation to create a permanent mural in a stairwell of the art center.